Emily Vork is a sophomore majoring in History, Religious Studies, and American Studies. 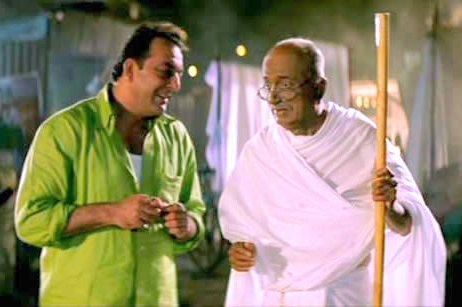 This post was written in response to viewing Lage Raho Munna Bhai as part of Dr. Sarah Rollens’ course, REL 360: Popular Culture/Public Humanities. What makes a person worthy of being treated as a national icon? There are so many people who show up throughout history and stand out, even today. They remain in the collective mind of a region—or a nation, or the world—and history looks fondly upon them. Towards the top of the list of internationally-recognizable names is Gandhi—the famous nonviolence activist from India. But, of course, you already knew that.